I Just wanted To Remind Everyone Of The Exact Words Of The Manhattan, Mormon Stake President Brent Belnap, When He Called Mormonism an "Alternative!!" 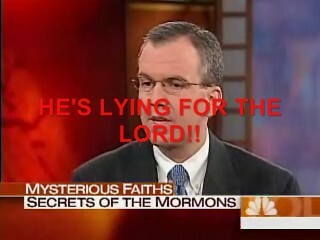 Hey guys, with the Mormon General Conference coming up, I felt the need to refresh everyone's mind regarding what Brent Belnap(the Mormon Stake President of Manhattan, New York), said to Matt Lauer on The Today Show in November of 2005. Matt Lauer, Today Show Anchor: "Are you saying it's the only path to God and Salvation or are you presenting it as an alternative? Mormonism is presented as an alternative religion......Ha Ha Ha...yeah right!! Brent Belnap and the Mormon Hierarchy are bold faced liars and they know it. Any former Mormon missionaries out there, that taught Mormonism as an alternative on your mission? If that was the case, what would be the point, right? The first video is the full, complete clip of the interview and the 2nd one is a re-mix of the first clip that I created, co-starring Gordon B. Hinckley, the Mormon cult Prophet of fraud. I just don't want anyone to forget how they lie publicly and blatantly, to further their cause of converting people into the cult. I'm going to watch this Mormon General Conference very carefully, to see if Hinckley and gang present Mormonism as just some alternative or option...LOL!! Yeah right!! Feel free to leave comments here or over on Youtube, as the Brent Belnap interview clip already has over 100 comments. For those that want to know more about this subject and my opinion on the matter, I dedicated an entire podcast to Brent Belnap's lies. Take care everyone and I'm back on course now, with a lot of great stuff on the way. Thanks for your patience!! Thanks everyone for your amazing support and donations! !